The “Fractured Square Series ” is my newest series and is inspired both by the art of Gustav Klimt as well as the seemingly fractured nature of life in this modern world. The process of reconstructing all the fractured pieces into a cohesive and beautiful whole finds form in this series. The “Architectonic Series” challenges me to create three-dimensional imagery from a two dimensional plane. M.C. Escher and other optical illusion artists inspired me to create surprising architectonic spaces that seem to change just when you feel you’ve figured them out. Hand-dyed and tightly spun wool, with its particular and beautiful light reflecting characteristics produce a texture and luminosity that no pigment on paper could. The “Universal Language Series” draws from my background in liberal arts at St. John’s College, and my and studies of Chinese mathematical images. It’s a challenge to make clear what mathematical concepts means without words. Circles, curves and fractal patterns explore the concept of nets or webs, all in order to showcase the principles that order our world. Feng Shui, based on the Taoist vision and understanding of nature, particularly on the idea that the environment is alive and filled with influential energy. The colors in the Feng Shui Series are an expression of one of the five Chinese elements: fire, earth, metal, water, and wood. The I Ching symbols describes an ancient system of cosmology and philosophy that is intrinsic to ancient Chinese cultural beliefs, centered on the ideas of the dynamic balance of opposites, the evolution of events as a process, and acceptance of the inevitability of change.All the pieces in this series celebrate the precision and elegance of geometric forms and formulas and the beauty of color and balance. The challenge of creating three dimensional imagery from a two dimensional plane is fascinating to me. I create surprising architectonic spaces which seem to change just when you feel you’ve figured them out. The placement of dark and light create the illusion of depth and the endless combinations of these placements intrigue me. I use wool as my medium because of it’s particular light reflecting characteristics that are so unique and beautiful. No pigment on paper could reproduce the texture and luminosity of the hand dyed and tightly spun wool that I use in my tapestries. I am very concerned about creating a fine textile which is the vehicle for my image; each should be of the highest caliber. I use a flat tapestry technique, with no slits or holes ensuring the integrity of the tapestry as a piece of cloth. I use a close set of 8 ends per inch and I pack the yarn very firmly at 30- 40 picks or passes of yarn per inch giving the tapestry an unusual combination of fineness and firmness of weave. 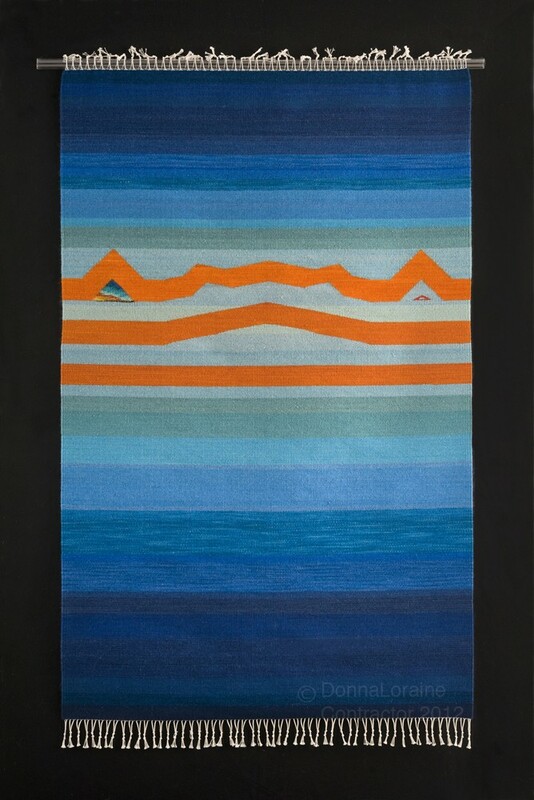 The tapestries are hand woven with 100% wool that has been hand dyed, giving the colors richness as well as some slight variations and is light fast. I use a strong cotton warp, the underlying structure of the weaving, which is finished at the ends with a hand manipulated edging technique, then finely braided and looped to fit around acrylic poles ,which are provided for installation. All the tapestries are fully finished on both sides as I laboriously sew in the tails of yarn from color changes, enabling the work to be free hung or used as a room divider.